This is a snapshot of the home page. 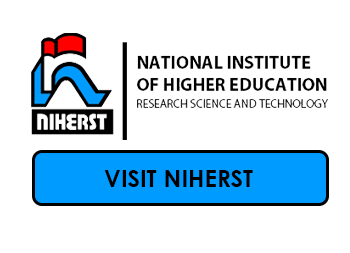 To Return Home, click on either the NIHERST logo or the STResearchTT Logo. This will return you to the home page. There are three ways to initiate a search for information. Via the Categories Menu. 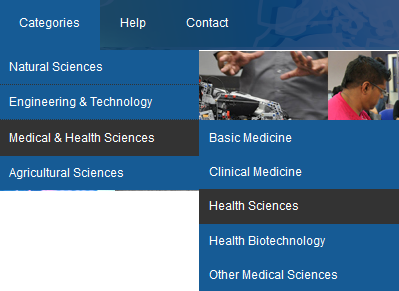 The Categories menu is on the top of the screen, in the horizontal menu. 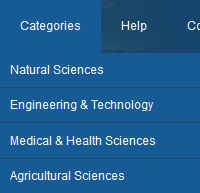 By Clicking on any of these headings, a drop down list of subcategories appears. Click any of these subcategories and a search will be initiated using that subcategory as a filter. Via the Home Page Search Bar. Type any search phrase in this bar (e.g. a doctor’s name) and the results will be displayed. The inner pages Top Menu Search bar. 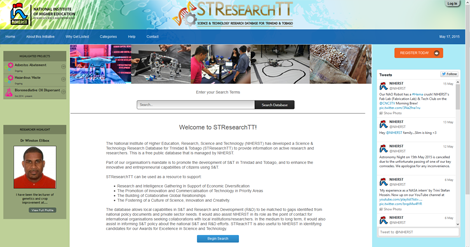 Most of the pages of the website, aside from the home page have a search bar in the top right hand corner of the screen. This works the same as the Home Page search. Just enter in a search phrase and results will be displayed. Once you have a list of search results, you can select one to view its profile. Clicking on any line of the listing will take you to the profile for that selection. 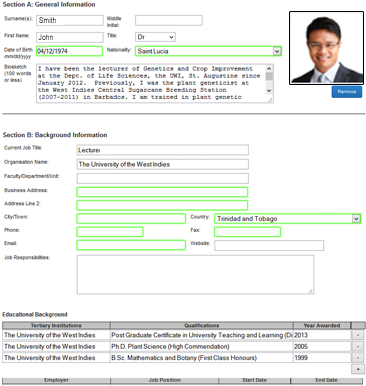 Please note that you cannot make any changes, only VIEW the profiles of search results. 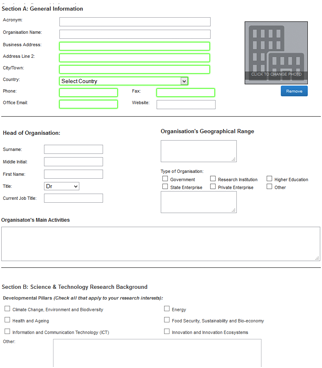 To register, a user will click the Register button on the home page or the Login page. 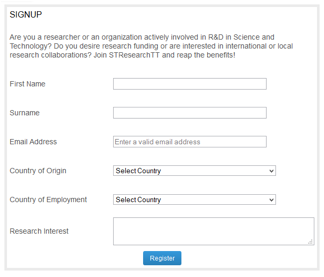 The Country of Origin, Country of Employment, and Research Interest fields will be used by the NIHERST representative to assess eligibility on a case by case basis for access to the STResearchTT profile creation service. Once a user has received email confirmation that they have been granted access, they can log into the website. They can do this by clicking on the LOGIN button on the top right hand corner of the screen. 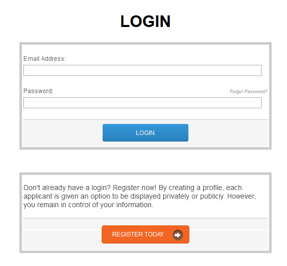 This takes you to the LOGIN screen, where you must enter a username and password. The password is in the email you received when you first signed up. Your username is your email address. 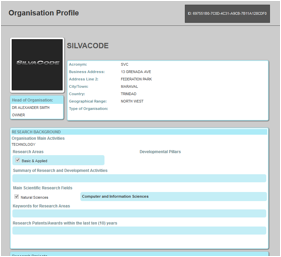 Once logged in the user has access to two new dropdown menu items: Create or Edit Researcher Profile, Create or Edit Organization Profile. Once created, you can edit the page any time by going back to the same menu item. The word “create” would now read “edit” so you can make changes to the same profile. 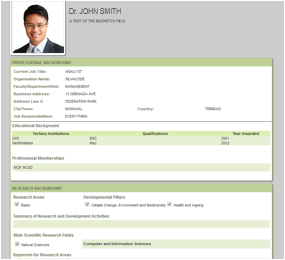 NOTE that one user can only create ONE Researcher profile and ONE organization Profile each. These profiles have the option of being Private (Only Niherst Staff can view them) or Public (anyone can search for them). Bear in mind that personal data is still not displayed in the Public view, i.e. 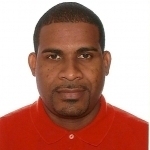 contact information, Date of Birth etc.